The city center had a lot to offer! The architecture was a mix of what you’d envision in places like Spain or Portugal with South American charm. There were terraces and balconies on almost every building, especially the restaurants! We were in this valley surrounded by mountains, tourists from all over the globe and many friendly street vendors (AND pups). The narrow streets really fascinated my mom and me because there were so many cars AND so many people weaving through them. We would chase after the sun because the wind and cool air picked up in the images you see above. I’m also lucky that I didn’t twist an ankle because the fitted sidewalks were incredibly uneven! My mom and I saw TONS of friendly dogs and bright colors while walking in the evening. 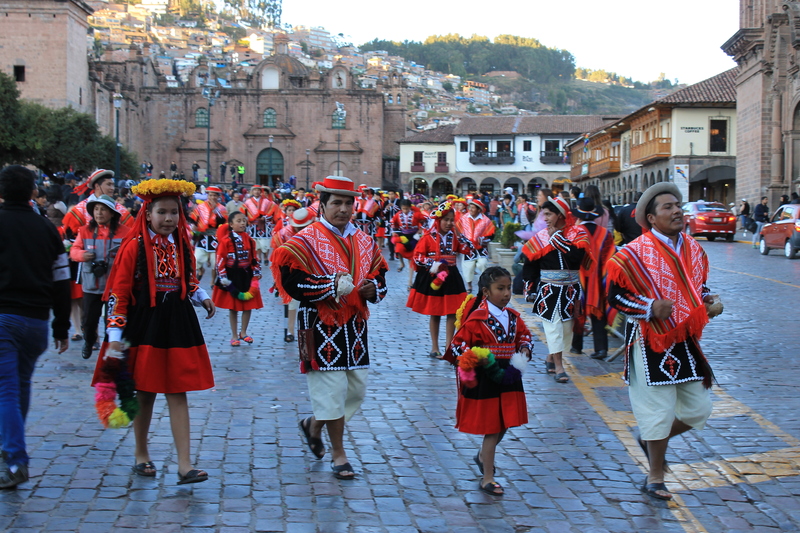 We also heard beautiful music and were able to see a fun parade during one of our nights in Cusco. Many consider Cusco a tourist trap, but I hope these photos prove otherwise. My mom and I really immersed ourselves in the culture and didn’t want to come home! I have a goddaughter in Peru. Very cool! I hope you can see her often! Cusco is such an incredible city! We were there last week and accidentally stumbled upon this amazing parade! I feel like you could spend an entire week exploring Cusco and still not have enough time. I’m SO happy you were able to visit this wonderful place, too 🙂 I completely agree with you – one week is not enough! I hope you had an amazing trip!